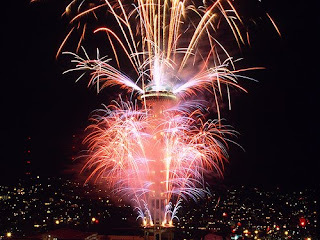 Just a wish from all of us for a Happy and Prosperous New Year. There have been a lot of good books in 2009 and we're looking forward to even more coming up. (A lot of bloggers publish their favorites of 2009 about now but we've been too busy--maybe next week) What do YOU look forward to reading in 2010? The Kane Chronicles? More graphic novels? More 39 Clues? More Erec Rex? Or something we don't even know about yet? Let us know! And don't forget--you still have until Monday to write reviews and get a free book for each one you send! When Becka's boyfriend Ryan wants her to attend a lecture on reincarnation with him, Becka thinks it's no big deal. But then, the speaker uses her as an expiriment, and get's involved in her personal life, even dating her mom. Scott, Becka's brother, learns from Z, his mysterious chat room friend, that the speaker, Maxwell, is very dangerous. And when Becka's mom sees his demonic power for herself, she and Scott try to convince Becka to get away from Maxwell and his evil powers. Becka won't listen, and winds up in the hospital when she thinks that she can find power over all the world in the headlight of an oncoming train.. Amazing story, awesome action, and a great life lesson. Great book! Also, Becka and Scott star in 11 other books in the Forbidden Doors series. Who knew that the rock Denise found in her old basement would actually be the key to an alternate world? When Denise gives her friend Nathan (who's a selfish brat) a bloodstone for his birthday, he thinks it's the worst gift ever. But when exposed to the light of the full moon, it sends out a distress signal to creatures from another dimension. When Denise and Nathan are sucked away to Fayrah with strange animals that call themselves Aristophenix, Listro Q., and Samson, they explore the new world. They find it's many surprises and dangers as they run into enemies of Imager, the One who creadted us all. Through action, suspense, and near death, Denise and Nathan find out how to fight the devil, and they also learn about the all-encompassing heart of God.. Great moral, great lesson, and great way to teach it. Denise and Nathan star in 3 other books in the Imager (or Bloodstone) Chronicles. When a meteor comes crashing through a school window, and a genie is found inside, he agrees to give Chase and his classmates 1 hour to decide on a wish. I really enjoy Dan Gutman's books and this was the best yet! Santa on an out-of-control 4-wheeler? Electrical Rudolph on the rampage? Nothing new for the only walking national disaster area, Wally McDoogle. Wally dreams that an angel named Bartholemew invites him to a birthday party... for GOD! As Wally tries this and that and everything else to make money in order to get the perfect gift for God, he finally bumbles his way into the real reason for the season. I love Bill Myer's books. He's my favorite author. This was awesome! As a side note... Bartholemew reappears in book #28: My Life as a Supersized Superhero with Slobber. Ms. Holly is Too Jolly! When Ms. Holly comes to Ella Mentry School, everything is Christmas related. There is one plus, though. Ms. Holly agrees that 2nd graders A. J., Ryan, and Michael can be Christmas Elvises in the school Christmas play. I love Dan Gutman's books, and this was really awesome. A. J. and his friends star in a brand-new series called My Wierd School Daze. When Dr. Brad, Ella Mentry School's counseler, picks 3rd graders A. J., Ryan, Michael, and A. J. 's rivals, Andrea, Emily, and Annete for his next expirement, the classmates are in for an adventurous time as A. J. hypnotizes Andrea and winds up climbing the school to save her. I really like Dan Gutman's books, and this is his newest. A. J. and his friends are also in a 21 book series called My Wierd School. Check it out! Well done, Lee! Since you have written eight reviews, you can claim eight free books!! If you other readers guys want in on the action, click on the Comments tab under this post and send your reviews to us. Read the post of December 18 to find out more. And click on the "Dan Gutman" tab under this post to see what we and your fellow reader guys have said about some of his other books. Merry Day After Christmas, everyone! It's the CARLMAN, hoping all of you have had a great holiday season so far. I certainly had a great Christmas. There's a Wii system in the CARLMAN'S house!! Oh, yeah! I must have been a good CARLMAN this year! When an old manuscript is discovered at an antiques sale, Jack Allen and John Avery Whittaker are left to decide if it's true. 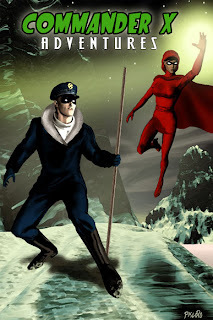 Anna and Kyle, in 1950s Odyssey, get sucked away to an alternate world called Marus. There they meet Darien, a young warrior who is about to marry Princess Michelle. The only problem is, King Lawrence hates Darien because of his popularity. The king tries many a plot to kill Darien, but when Prince George, Darien's best friend, tells Darien about the plot, Darien is able to avoid the schemes. When Kyle and Anna develop supernatural powers from the Unseen One (which who God is known as in Marus), they are able to help Darien become king in the end. There are many great adventures in between, including Darien climbing the side of a moving train, Anna nearly being killed, and King Lawrence going completely insane! Even if you have never heard the radio drama, Adventures in Odyssey, from which this story was taken, it's a great read for anyone and everyone! Also, Adventures in Odyssey now has this book in audio drama form if you don't feel like reading it. Awesome book! When hobbit Bilbo Baggins teams up with 14 dwarves and a wizard, they travel together through the countryside and face many hardships, including avalanches, enchanted water, nasty elves, and a guy named Bard. Their ultimate goal? To defeat Smaug, the dragon that has terrorized the mountainside for many centuries, and to gain all the treasure that he has stolen over the years. This was a really good book. It has a prequel, The Simirilian, and sequels, the Lord of the Rings series. A great read! I really loved the book Greetings from Nowhere. It was about four people who all had big problems they had to deal with. One of the things I liked about it was that there were numerous protagonists. I liked how each of them had a problem at first, but in the end they decided to forget their problems and have fun and make friends. I think this was an exceptional book since it had a good moral. One thing I didn’t like was that not all of the characters were friendly. One of them stole lots of things. He wasn’t a very good character because he didn’t play a very important role in the story. But overall, it was a very good book.So that is a little bit about the book Greetings from Nowhere. I recommend it to all readers who want a good read. Thanks, guys! These all sound good. The Hobbit is one of my all-time favorites. (Tolkien and C. S. Lewis are my all-time favorite authors) I must confess I haven't read the other two but they sound good too. Other guys have read and liked another Barbara O'Connor book; if you want to find out which one, click on the "Barbara O"Connor" tab under this post. Good work, reader guys! Keep those reviews coming. Don't forget that you get a free book for each review! Go to the post of December 18 to find out where to pick them up. And go find these books, everyone! I just wanted to get in one quick last post before the Christmas Holidays. There is an all new Commander X Adventures Online Book/Graphic Novel that is out for the Holidays. I really loved it and wanted to share this early Christmas Gift with you all. So here is some really good general information. The entire thing was just a gas to read. If you like your adventure high and fueled with excitement, what are you waiting for??????? Give it a look see. Very Excited I Am! Our First Review! What it is about: It began with a man named Mr. Hoppy who was in love with his neighbor whose name was Mrs. Silver. But Mrs. Silver was in love with someone else, her pet tortoise which was named Alfie. Finally Mr. Hoppy thought of a plan. Mrs Silver was always wanting Alfie to grow bigger.So Mr. Hoppy went to the local petshop and purchased several tortoises. When Mrs. Silver went to work the next day, Mr. Hoppy replaced Alfie with another larger turtle. So this went on until the fake Alfie couldn't get his shell through the opening of his little house. Finally Mrs Silver noticed him and called Mr. Hoppy down to look at him. It was while they were having tea together that Mr. Hoppy gathered up the courage to ask her if she would marry him. "Of course I will" she said. "After all it was your magic words that made him grow" Mrs Silver said. So they got married and lived happily ever after. Many thanks, Augustin! Very happy you have made me. Come to the Imaginon or Matthews or Mint Hill library and get your free book. Or live out of town you do? Call Carl, give him your address, and get it to you he will. (his number is in the post under this one) MORE reviews from you guys I hope to get! Doubly Excited I Am! MORE Reviews! 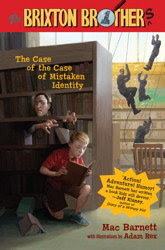 When Jonah Skidmore and his friend Chip find out they're adopted, they and Jinah's sister, Katherine, are caught up in a bizarre series of incidents, leading up to the fact that they and 34 other kids were taken from different places in history by people from the future and put on a time machine disguised as a plane. 13 years later, in a clever scheme brought about by the people from the future, 35 of the kids and Katherine are gathered together and travel through time when Jonah offers to fix time for the people of the future. Now he, Chip, Katherine, and one of the kids on the plane named Alex must do that in the 15th century. I enjoyed this book very much. I love time travel, and this is a must-read book for any and every time travel fan out there! When aliens capture some people from Earth, they are in for a surprise. Using a machine that can make holes in time and space, they travel to numerous planets, from Hellebeezia to Arboria, and finally to the ultimate destination of Skreepia.In the end, the people from Earth escape with the help of a friendly skreep (the aliens who live on Skreepia, that is), and with the space-time machine, they return to Earth 10 minutes after they left on a journey that took months. I personally think that this is the best book that I have read in my entire life. I loved the time travel content, and I also enjoy books about aliens. So to me this was the perfect combination. After the Rapture occurs, four kids realize their mistakes and believe in God, and they are determined to face the Earth's last days together. Now, in the 25 books later, three of them remain. The Antichrist, Nicolae Carpathia, has been killed by the sword, as predicted in the Bible. As Carpathia's organization, the Global Community, burns downevery believer's house they can find (because they blame the believers for every bad thing that happens), they trace one of the kids and her new friends to her new hideout (they destroyed the old one). As the girl, Vicki, and her friends prepare to take off, they find that their car won't start. Hiding, they must wait for the GC to come and leave, hoping that they won't find them. Meanwhile, in New Bebylon (the city Nicolae created), the other two kids, Judd and Lionel, witness first hand Carpathia raising from the dead and coming back to life. Carpathia is now inhabited by Satan himself. As Nicolae gives his "I Am God" speach (which everyone who's not a Christian believes), the exect halfway point of the 7-year Tribulation is reached, and the kids must now face even worse: The Great Tribulation. I enjoy this series very much. Their are 40 books, and if you're scared of the Rapture, the authors have a bunch of other great Christian books just wairing to be read! An excellent piece! Thanks, Michael! Come by Imaginon or Matthews or Mint Hill to get your free books! (since you sent 3 reviews, you'll get 3 books!) Look forward to hearing more from you, we are. Other reader guys, check out these books you should. Carl read Found and liked it--you can see his review here. The second book in that series is out now and it's called Sent. (Read that one Carl has not) AND you are now the front runner for our special prize package. Keep up the good work and let's hear from MORE of you reader guys! Greetings, reader guys throughout the galaxy, 'tis I, Yoda Claws. The season of giving it is and give out gifts I will. The holiday break is almost here and that's a good time to hear about the books you're reading. Therefore, give out books I will. I'll give a free book for each review you send in. You can tell us about a chapter book, a graphic novel, a nonfiction book, a biography, or even an audiobook. Tell us the name of the book, the author, what the book is about, and why you did or didn't like it. AND--give a special prize package we will to the one who writes the most reviews!! We'll continue this special offer until January 4, when go back to school you do. Writing to us is easy--just click on the comments section under any post and write your review. If you have more questions, look on the column on the left-hand side of the page. Give you instructions it will. Also, if you want to find good stuff to read, check out some of the links on the left-hand side of the page. Unlike that other Claus fellow, I can't be everywhere, so pick up free books you can at the Imaginon library or the Matthews library. My special padawan Master Jedi Zack will give you your books at Matthews. 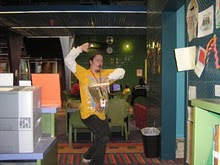 Or you can see that sith lord Darth Bill or the CARLMAN, who brings balance to the Force, at the Imaginon library. And I have learned through the Force that several reader guys use the Mint Hill library, so you can pick up free books there also. Just ask for Miss Linda or Miss Donna. (I assume they will be jedi--unless Darth Bill turns them!) Questions you have? Call Bill or Carl at 704-416-4630 or Zack at 704-416-5022 or Linda or Donna at 704-416-5200. But you canot just go to a library and say you wrote and want a free book--you tell the librarian who you are and which book you wrote about. And live outside of Charlotte you do? A problem it is not. Just call Carl and give him your address and get it to you he will. <--- Master of The Bookends of Death!!!!!!! Salt Water Taffy, Vol. 2: A Climb Up Mt. Barnabus: The Seaside Adventures of Jack and Benny by Matthew Loux. 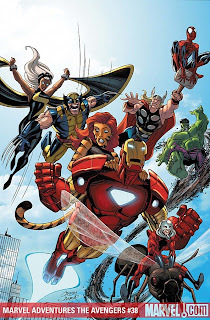 Marvel Adventures: The Avenger - Invasion by Paul Tobin, Dario Brizuela, etal - This most excellent of Marvel Adventures Avengers' presented in Graphic Novel (GN) Format collects issues 36 - 39 of the comic. 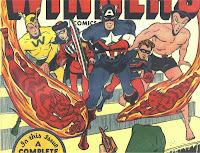 My favorite story of the four collected involves the Avengers taking on the the equivalent of the Avengers from the 1950s, The Invaders (The Original Human Torch, Toro, The Sub-Mariner and The Whizzer), with the assisitance of two out of time Invaders Miss America and Golden Girl. The Invaders have appeared in our present and are attacking the Avengers (in this story made up of Captain America, Spider-Man and Wolverine). To make matters even more confusing, Captain America belongs to both these Teams (for those of you who do not know about Cap, he is from the past but was thrown into the future---there are stories out there that explain all this). Who will win in this epic clash? Why are the Invaders fighting the Avengers? Whose side will Cap take? Read the story and find out. Other stories included in this GN include such heroes, besides those already mentioned, as Storm, Iron Man, Tigra, The Hulk, Ant-Man and Luke Cage taking on some most vile villians as an Evil Genie, The Mandarin and The Leader among others. Got to agree with Carl on this one. Really fun stuff so give it a try!!!!!!!!!!!!! P.S. I'm glad The Carlman enjoyed it as much as I did. I am a Sith but even Sith have moments when they can be kinda nice. Teenage Mutant Ninja Turtles: Heroes In A Half-Shell by Michael Dooney - Cowabunga, dudes!!!! Did you know "The Teenage Mutant Ninja Turtles" turned 25 years old this year? Dudes, it's time to party with some pizzas and tasty beverages!!!!!! Also to celebrate the turtles' birthdays (Michelangelo, Leonardo, Raphael and Donatello), this awesome Graphic Novel has been put out and it rocks, dudes!!!!! It pits these Ninja Turtles, with the aid of their teacher and mentor Splinter (once a human master of martial arts turned into a man-sized rat) and a human named April (a reporter), against evil bad guy martial artist Shredder and his minions (Be Bop - a cross between a human and a wild boar, Rock Steady - a cross between a human and a rhinoceros, the living brain Krang and more). Believe it or not, I have an issue of the very first issue of "The Teenage Mutant Ninja Turtles. So I guess that makes me 25 years + ? years old. 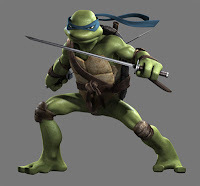 <---Michelangelo - Master in the use of Nunchakus!! 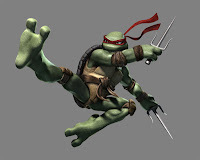 <- Raphael - Master of the Sai!! 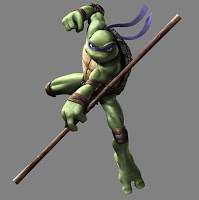 Donatello- Master of the Wooden Staff!! Well that's all I got guys. If I don't post again until after Christmas, Happy Holidays all!!!!!! 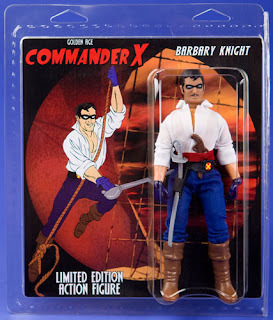 Yes, indeed, all you rip-snortin' reader guys, I grew up herdin' cattle and readin' comics. 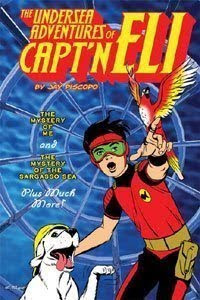 The graphic novels we have now are just as fun as what I read way back then. Darth Bill just handed me one that I enjoyed more than a three-day rodeo! It was Marvel Adventures: The Avengers--Invasion. And there was not just one story but FOUR in this fun-filled GN. The first one had the Avengers fighting a genie!! How could they fight against a magical being?? The next story had some Golden Age heroes pop up in present-day New York City. How did they get there? And who do they have to battle? You gotta read it to find out! 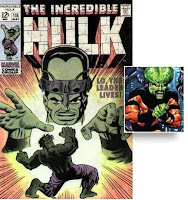 The next story has the malevolent Mandarin creating a robot that drains each Avenger's power into itself--and the team can't use thei full strength anyway because the Madarin is holding a third-grade class hostage! Finally, the Leader is trying to fire a space-based super laser into New York City and the Rhino is helping him--or is the Rhino just faking? These are great stories, guys, full of action and wisecracks. Everything you'd want in a graphic novel!! So what are you waitin' for? Saddle up your horses and go get one!! PS--if you want to know about more good graphic novels for guys, click on the "graphic novels" tab below! 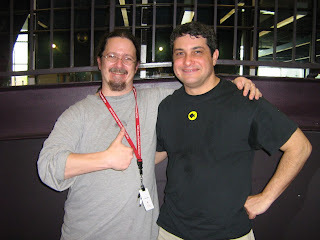 PPS--why would Darth Bill, a sith lord, do something nice, like lending me a graphic novel?? 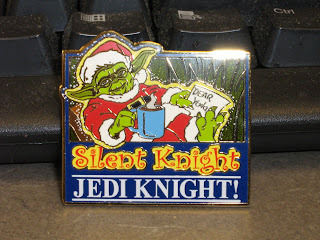 Because, when the Kandy Kane Kid shoots with both barrels full of holiday cheer, not even a sith can resist! Yeee-haa, book-reading buckaroos, this here's the Kandy Kane Kid. I come around every December, telling guys about good reads. The first book is Kringle by Tony Abbot. I wrote about it two years ago; read the review here. This book's really good--a terrific, action-packed fantasy about how Santa Claus became Santa Claus. Wait a minute--an epic fantasy about Santa Claus?? Yep--and it's not what you'd expect! Go check it out. You will definitely enjoy this one!! Odd and the Frost Giants by Neil Gaiman (the audiobook version) Do you like audiobooks? I sure do and I enjoyed this one. Neil Gaiman reads it and he does a good job narrating the story and giving different voices to different characters. (His reading is funny, too!) The story is about a young Norse boy in times gone by who helps get Thor's hammer back from the Frost Giants. (see Bill's review here) If you want to find out about more audiobooks, click where it says "audiobooks" under this post. I've always said that READING IS IMPORTANT, guys!! Now you have proof! Whoopee! 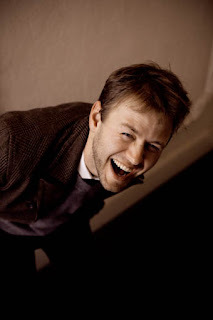 An Interview with Mac Barnett! Yes, siree, Mac Barnett, author of the terrific The Brixton Brothers: The Case of the Case of Mistaken Identity, has been good enough to grant us an interview. Listen up, guys--he's a lot of fun! The way I see it, it’s not my job to tell kids why they should be reading. It’s my job to write books that make kids want to read. Reading should never be something you feel like you have to do, like putting on sun block or taking a multivitamin. You should go to books because they’re enjoyable. I hope that’s why kids read my books, anyway. Good point. I think you've got one here that's enjoyable. Well,then, is it cool for boys to write? Why? Sure. Here’s one reason: People who write well get what they want more often. That’s a good thing. Steve Brixton is a big fan of the Bailey Brothers mysteries, which seems like an obvious reference to the Hardy Boys mysteries? Were you a fan of those books as a kid? Or not? I was a huge fan of the Hardy Boys. I loved everything about those books, except the fact that Joe was considered the less handsome brother. The only difference between him and Frank was that Joe was blond, and I was blond, and I never really got over that. Were you a fan of any other book series? Definitely. I read a lot of series. Henry and Ramona. Fudge. Narnia, Lord of the Rings, Shannara, and Xanth. The Hitchhikers Guide. That sounds like a lot. My jokes would probably start to get old around book fifty-eight. I can promise you that there will be at least three Brixton Brothers books, though. I’ve recently taken up photography. All my pictures are of a bunch of wild turkeys that visit my house, and I took them all on my cell phone, and none of them are very good. But today I saw the lead turkey and he was huge. His head was red and he was twice as big as any other turkey around. I ran over and took his picture with my cell phone. It’s not very good. I like pizza. And I like to keep it simple. You could put a ton of toppings on a piece of boot leather and it would probably taste all right. But a good cheese pizza—that’s hard to make. Thanks, Mr. Barnett! I really enjoyed this book and am glad there will be at least two more! Go get this one, guys!! 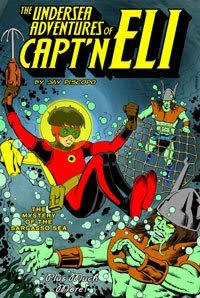 Incredible Danger, Intrigue, Stupidity and Lost Worlds!!!!! For the first review The CARLMAN and I decided that, since we both loved these books (Graphic Novels), and since the comics have been around a long time (even way back when we where young...ouch), we'd read them again. Don't worry though--these books have been put back out in a fresh format and are as good as ever. "Spy vs Spy was the brainchild of Cuban-born political cartoonist Antonio Prohias, who fled his country after receiving death threats from Fidel Castro. Prohias settled in America, and in 1960 he began a 26 year run of Spy misadventures in Mad Magazine." Sounds like a pretty interesting guy to me. 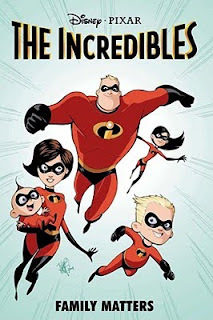 The Incredibles: Family Matters by Mark Waid and Marcio Takara- To be totally honest with you when I started reading this Graphic Novel, I did not expect much from it. I am very happy to report, man, that I was so wrong. I should have known better with the most excellent Mark Waid doing the writing duties. Also Mr. Takara's artwork totally rocks!!!!! The story starts out with The Incredibles -- Mr. Incredible (Super Strength), Elastigirl (Stretching Powers), Dash (Super Speed), Violet (Force Field Generator) and baby Jack-Jack (Powers ?) -- taking on the villainous Futurion (Time Powers) at the zoo. Much to Mr. Incredibles' shock and dismay during this battle and even before, he seems to be losing his super strength. How does he tell his super-powered family much less face up to the fact that he is no longer a super? Read this incredibly well written and well drawn GN to find out. Oh, almost forgot to mention, that my favorite super-hero in The Incredibles' Universe, Frozone also shows up in the GN along with other surprises. Cool Stuff!!!!!!!!!! Atlantis - The legendary city beneath the waves. Knossos - The home of the Greek Mythological Minotaur. Pompeii - The very real Roman City that was destroyed by a massive volcanic eruption. This book is both a joy to look at and read!!!! Don't miss the opportunity to check it out. I really can not praise this book anymore than I have. Awesome, awesome, awesome!!!!! !